Sylvia Electrical values your business and will make every effort to offer affordable payment options available. In addition to checks, the following credit cards are accepted and securely processed PayPal. All personal consumer information collected by Sylvia Electrical Contracting will be stored confidentially in our customer database. Information collected is not shared or sold to other parties. Sylvia Electrical Contracting is a secure website. 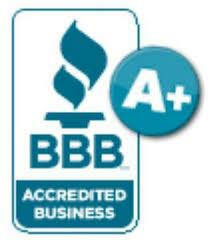 Visit BBB for further information and our A+ Accreditation.